The Pure of Heart Crystal Brooch Bouquet from Luxurious Wedding Accessories offers the ultimate blend of Bling and Vintage Glamour in a Silver & Ivory Brooch Bouquet, Champagne Flutes & Cake Cutting Set. The Brooch Bouquet has Sparkling Swarovski Crystal and Pearl Brooches dramatically arranged to create an alluring floral cluster. The handle is tightly wrapped with ivory or white satin ribbon. Can be made with only Crystal Brooches. Also available with Gold backed Crystal Brooches. The matching Champagne Flutes and Cake Cutting Set complete the Pure of Heart Collection. 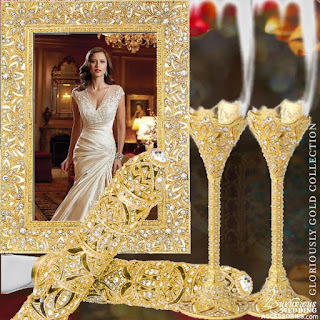 The Dazzle Swarovski Crystal Simplicity Heart Champagne Flutes, Ring Box, Cake Set and Picture Frame from Luxurious Wedding Accessories is modern and flirty. So precious, our hearts are pounding. A perfect gift for any bride. Handmade in the USA on a Silver Plated base that has been embellished with gorgeous and brilliant Swarovski ® crystals. The Pumpkin Coach Swarovski Crystal Ring Box is encrusted with brilliant crystals. It has a 24 karat Gold Plated Carriage decorated with Clear Swarovski Crystals. Hinged Lid on the crown. Pumpkin Enamel Interior. Perfect for an engagement ring box or use it during the wedding ceremony to exchange rings. Measures: L 3.50" X H 3.00" X W 1.75". The Tuxedo Wedding Collection in Black and Silver is made with hand-set clear Swarovski Crystals. 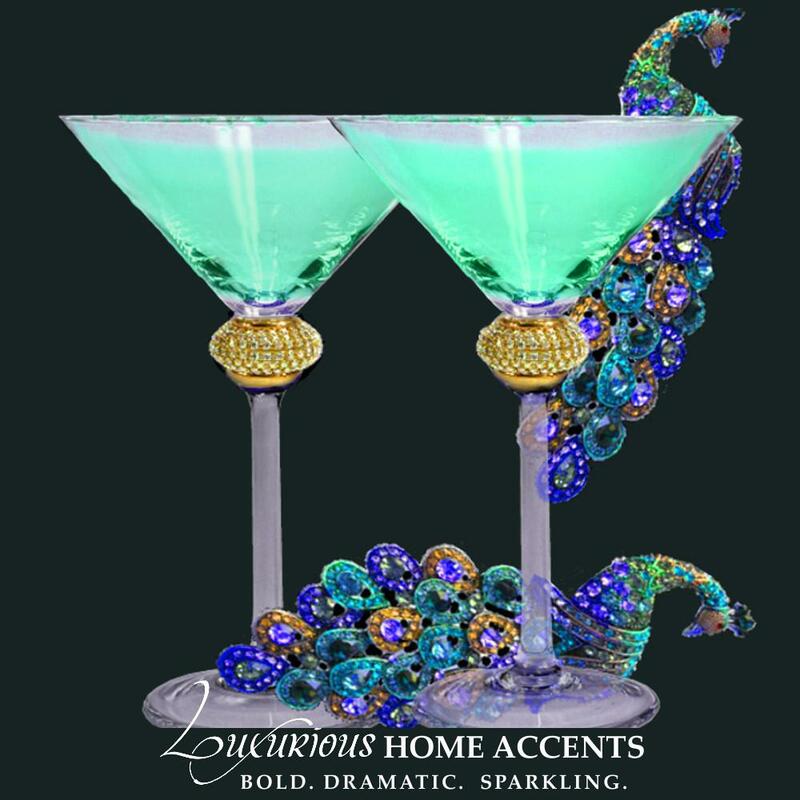 The Tuxedo Champagne Flutes have a crystal clear glass bowl over an intricate filigree silver tone metal design embellished with Swarovski Crystals. Combine the Flutes with the Coquette Cake Knife and Server Set made of hand-set clear pave Swarovski Crystals that form a sparkling mix with a lane of clear Cat’s Eye on a base of silver tone metal. The Pearl Enamel Swarovski Crystal Wedding Cake Knife, Server and Champagne Flutes, Pure of Heart, are an expression of true romance. The Pearl Bliss Pure of Heart Cake Knife and Server Set is made of hand-set clear pave Swarovski Crystals mix with white Cat’s Eye on a base of pearl hand-enameling. Engraveable stainless steel blades. Sold as a Set.